Dents are an inconvenience, and are hopefully something that will not happen to you. Yet for many of us, we will be impacted by a dent to our car at some point or another. Having the facts and knowledge associated with all things dent-related can be helpful if your car ends up looking a little rough around the edges. As Dallas’ Top Rated® Paintless Dent Repair, all of us at Dent Mechanic Group are highly qualified in making sure your car gets back to normal. Take a look at some frequently asked questions that DMG addresses and answers to help build your dent-related knowledge. Is it worth it to fix the dent? Dents can of course range in all shapes and sizes. Having a tiny dent might seem like not that big of a deal, and that you won’t need to worry about it. However, the size of the dent can actually make no difference in the overall effects that can be caused as a result of a dented car exterior. If you choose not to fix a dent, the best-case scenario results in your car losing its value. When you eventually try to sell your car, a dent is an obvious blemish that will completely lower and negatively affect its price. Even if you don’t go through a dealer to sell your car and instead try selling through personal advertising means, your car’s value will be lessened significantly with a dent in place. Taking the time to fix the dent means helping your car in the long run. In a worst-case scenario, a dent could affect your car’s paint sealant, which is what protects your car from rust. As you can probably imagine, this scenario results in your car being at a higher risk for rust and corrosion. Once rust starts occurring with your car, it will only continue to grow—not only in damage to your car, but in price as well! No matter the size of your dent, it’s completely worth it to fix. In the long run, your future self will thank you! Talk with DMG | PDR to find the best solution for your car. Can a dent cause long-term damage? To expand on what was discussed in the last question, a dent can make your car more susceptible to rusting if the car sealant has been affected. This not only hurts your car’s appearance, but rust will continue eating away at the metal in your car, affecting both the exterior and the inner workings of the car over time. So can a dent cause long-term damage? The answer is yes. Just to give you an idea as to the price of repairing rust, Rust Repair states, “A small spot [of rust] is one that is no more than two inches in diameter. In these cases, the materials needed to fix the spot can be purchased at an automotive supply store for around $30.” This is only for a tiny spot! Not to mention this does not account for labor, which can result in additional charges. Trust us when we say it’s time to fix that dent. Do som e cars dent easier than others? Several decades ago, steel was heavily relied on for car manufacturing. In more recent years, steel is still being utilized for frames, but there is increasing popularity in switching to aluminum. Aluminum is lighter than steel, which can help with fuel efficiency, but it’s more expensive as well. Many cars rely on plastic for parts of their exterior, such as for bumpers or spoilers, as they are significantly less expensive to produce. Cars must pass a lot of tests before they get put on the market. That being said, cars made with plastic are cheaper to manufacture but can be more prone to denting. However, their dents can be easier to repair. At Dent Mechanic Group, we hope that a dent to your car will be the least of your worries. We know that even when you have a dent, you will still be worry-free when you choose to work with us. Our confidence in our ability to serve both you and your car comes from a team of qualified and experienced experts. 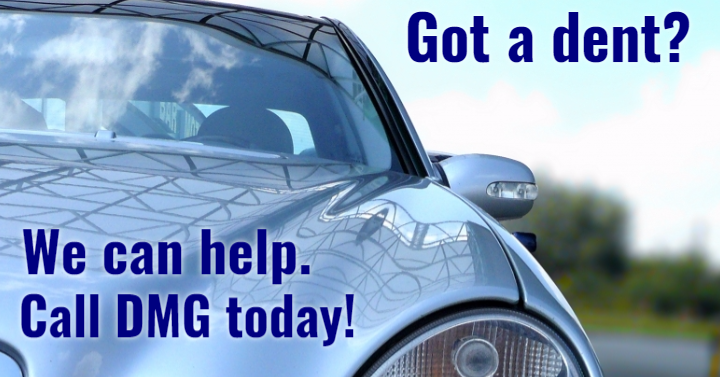 Don’t let a dent bring you down, call DMG | PDR to fix your car dent today!